We got asked the other day during a meeting – “who is the better photographer out of the two of you?” Such a good question, and one we’ve actually never been asked before by a potential client. – We photographed our first wedding in 2008. It was for friends, and we had never worked as “photographers” before. – I tried going full time for our business in 2012. I was the WORST work from home person EVER. I kept falling asleep on the couch everyday after lunch. I couldn’t figure out why I was so bad at this. Turns out, I was pregnant! So, I went back to work (I did school photos) so I could earn maternity leave. – I went full time in 2013 when Callum was born. It was then that we decided I wouldn’t be going back to work for anyone else. Instead, I worked in the cracks of motherhood. Nap time, after bed time. It was tough some days but so worth it. – Gareth went full time with our business in January 2016. With two kids, and our photography business, something had to give. He needed to spend more time with the boys, and this was how it was going to happen. It was a giant, scary (TERRIFYING) leap, to let go of a secure income to peruse our dreams. BUT we did it, and we have never looked back. So when people hear this, they assume that I was a photographer before Gareth, since I went full time first, but he had a job we could rely on, which is the only reason I went full time. The truth of the matter is that Gareth has taught me everything I know. He has owned a camera since he was 12, and he has always been passionate about photography. He is constantly reading, always learning new techniques and new ways to edit. He’s always trying to improve on his craft and works really hard to do so. He was the one asked to photograph our friend’s wedding, and he taught me to use a professional camera just so I could help him. So in my very roundabout way – we are both great photographers. I’m not tooting our horn, it’s just a fact that we’ve worked really hard to become. But Gareth is always in the trenches learning ways to make us BETTER photographers. That’s why we work so well as a team! He knows all the gear, all the ins and outs. He teaches me what I want to shoot so I can create long lasting images for clients. I work hard to keep in touch with all of you. So, if you’re new here – hi! We’re Shauna & Gareth Roughley, the photographers behind Roughley Originals Photography. You hear from me the most, but trust me when I say, this is a full partnership. And those gorgeous boys in the photos with us? They’re ours, and they’re amazing. When Alisha and Kane sat down with us in our studio we instantly hit it off with our mutual love of New Zealand. It was like meeting old friends, recounting anecdotes of past adventures. They are the best kind of people. Laid back, fun, the type of people we are so happy to hang out with. 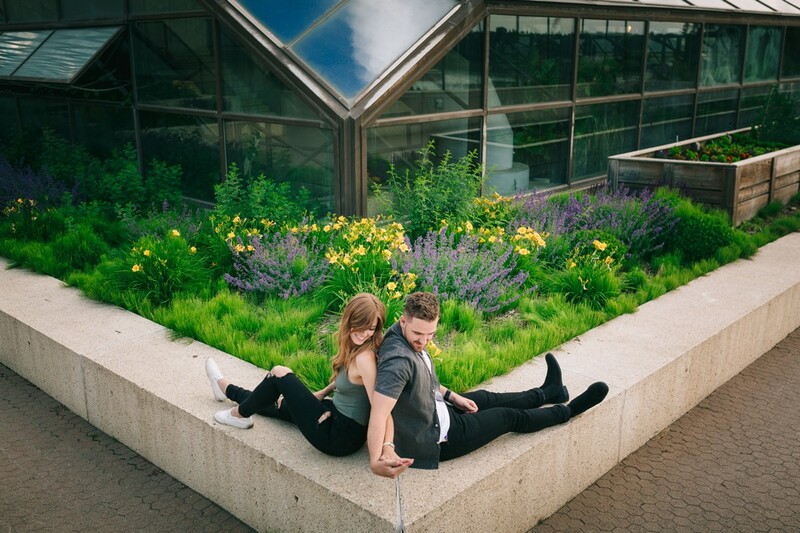 I met them on a warm summer evening to capture their Edmonton downtown engagement session. Edmonton comes to life in the summer, and this year they’re pulling out all the stops. The first Happy Wall in Canada has appeared in Churchill Square, and Alisha and Kane had a blast adding their initials. Strolls through the streets, a stop for a drink at a local favourite of ours, Tzin, they had such a fun evening celebrating their engagement. These two are the real deal. Shauna and I are so excited to be a part of their wedding today! For more information about our engagement and wedding packages contact us here. We are always happy to chat. With every wedding inquiry we receive we want to meet. Preferably in person. Skype and FaceTime works too. We spend, on average, 10 hours with you and your wedding party so it is important to know that we are a good fit. On top of this we will be in contact throughout the planning stages, not to mention the engagement session. All of our wedding packages include an engagement session. You and your partner may never have had professional pictures taken. We want to put you at ease in front of the camera, have some fun and get to know you better. Natasha asked for water, country and beautiful light for her session. There was no question where we should go. 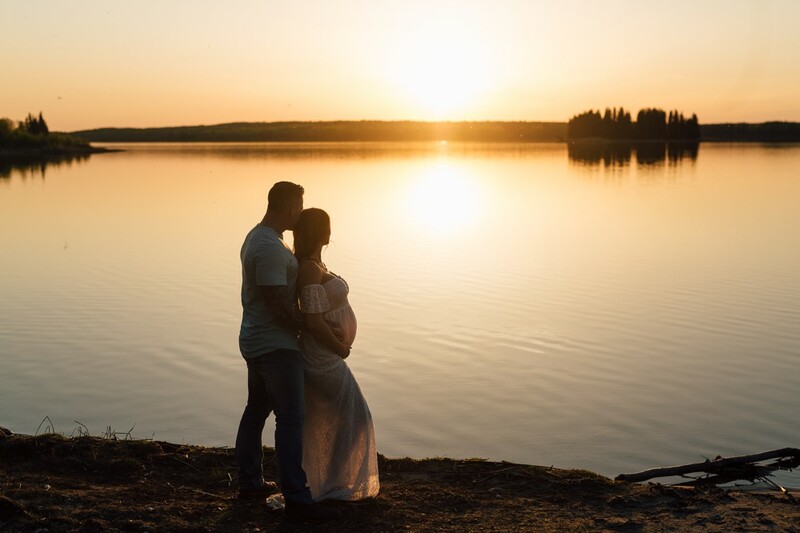 We waited for the leaves to start blooming in early spring, then it was time for their sunset maternity session at the lake. Anytime anyone wants to come out to our lake lot (which is two hours outside of Edmonton) I’m always, ALWAYS game! The sunsets are always incredible, the views are stunning, and I always feel so peaceful working out there. Having amazing clients come out to such a sacred spot to us is so cool. These two fell in love with the location as soon as they arrived, and it was so obvious they’re outdoor people. We walked the dirt roads, into the paths, and the cuddled among the birch trees and the mosquitoes. The warm summer evening made way for another stunning sunset, and they cuddled close on the lake shore. Natasha & Ben, you are absolutely welcome to come join us at the lake anytime. This was such an incredible session, and you’re both just wonderful. Can’t wait to meet this babe! A bride always wishes for bright sunshine on her wedding day, right? She wants to see the rays of sun shining down on her, she wants to feel that warmth on her face. But photographers LOVE a day like this. A day that the sky has some depth. A day with some clouds to help shield the sun so everyone isn’t squinting. Don’t get me wrong, we rock whatever weather comes our way. But this overcast, cool day, made our job easy. Want to know what else made our job really easy? Steph and Tom. They didn’t get shy in front of the camera, they didn’t make it a big thing. They let their joy, their excitement, their absolute love for each other shine through. Their Old Timer’s Cabin wedding was just gorgeous, but their joy on the day was even better to witness & document. The people surrounding Steph and Tom are amazing. They have a pretty incredible village, and we witnessed many, many moments of love. Steph’s sisters & her nieces were such a big part of the day, including two of their nieces MCing the wedding. And what do you do when you have two kids MCing a wedding? Well, you give them NERF guns of course to keep the speeches to a minimum! Their wedding was classy but laid back, precise but friendly and full of laughter (and definitely a few tears). It was everything you could want a wedding to be. A huge, huge congrats to you guys! We are so incredibly happy we got to be a part of your day. Summer in Edmonton is always beautiful. The air is warm and the city holds a laid back, happy vibe. Edmontontonians are happy to get outside, explore the city, and play in the water at the Alberta Legislative grounds. When it was time to book Eliana’s one year session, both her mom and I wanted the photos to be outside. We had photographed big brother Milano’s one year photos outside – (check them out here, he’s SO little!) – so it was only fitting to do the same for Eliana. 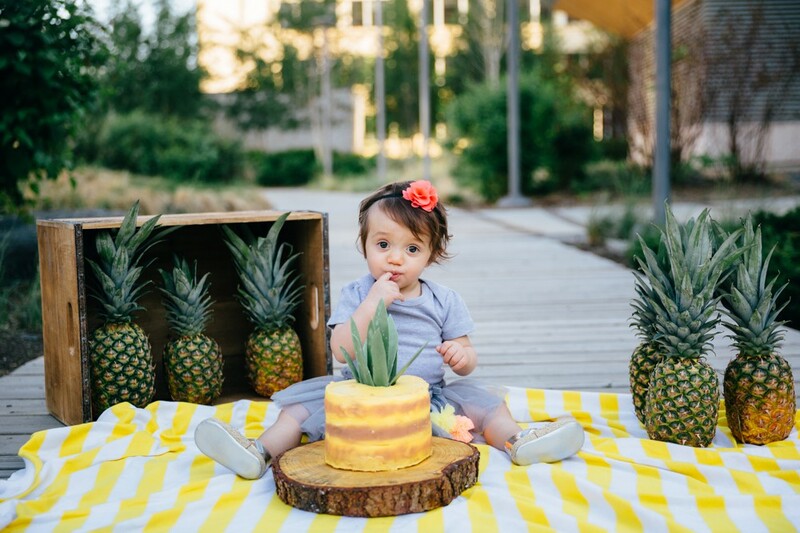 When Maria said her plan for this session was a pineapple themed cake smash, I could just picture it! This location stuck out in my mind, so I knew it had to be done here. Fresh pineapples was all I could think about, so Maria searched a few grocery stores (it seems they were hard to find that day!) and she finally found them! We didn’t need much else to bring this theme to life. I never want to use too many props in a shoot, I find it can take away from the focus, which is child! A few well placed details can add so much to a photo though, so that’s what we did. Maria added on family photos to Eliana’s one year session, because Eliana looks a LOT different as a one year old than she did at her newborn photos – check them out here. A lot of people don’t think to add on family photos to a one year session, but it’s a year later! These little ones have changed a ton in the last year, so it’s worth documenting them as they change. I have known this mama for many, many years. We photographed them when they got engaged, when they got married, when she was carrying both of her babies. Then came newborn sessions, family session, mom and me sessions. We have been able to maintain contact and hang out together largely because I still get to photograph her, and for that I am so grateful! Life gets busy and it’s hard to see everyone, so getting to photograph old friends is a big bonus in my life. Thank you so, so much for such a fun evening! Love you guys to pieces. What a beautiful family! We had the honour of photographing their maternity photos, their Fresh 48 photos, and now their newborn photos. It is amazing to document a family through changes and additions, it means so much to watch a family grow. Beautiful Everly came to see us in our studio, and I couldn’t love this session more. Our studio sessions are really easy for families because you just have to get here. You don’t have to worry about cleaning your house or having messes, the studio will be ready for you. We have a cozy bed to use (a lot of people don’t realize the bed photos are in the studio! ), tons of props blankets, and everything we need for your photos. Dad brought his jerseys for some photos, which we always love; we are always happy to include sentimental props in any of our photo shoots. The main aim of our photography is to document connection. Newness. Love. So always be prepared to cuddle up, get cozy, and let that love shine through. These guys did that and then some, it was so incredible to document them through change of adding Everly into their fold. Thanks so much you guys, we hope to see you again! We’ve all seem adorable cake smashes! We’ve all loved them too. 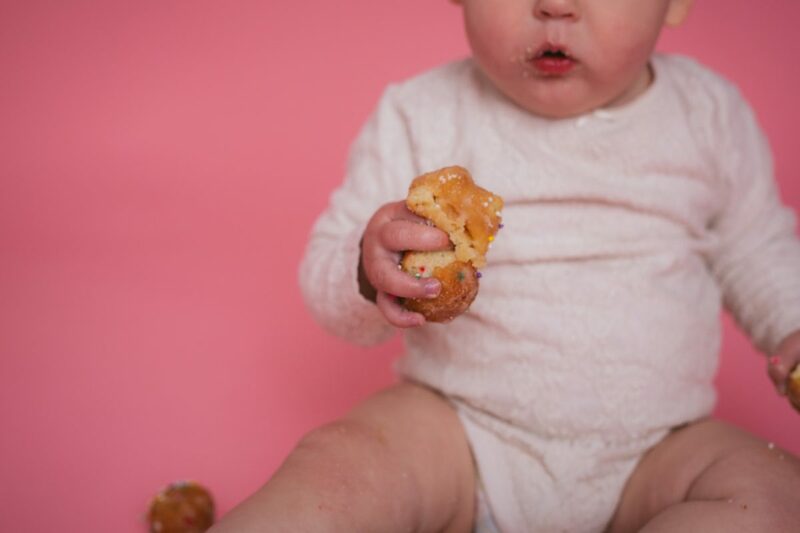 But my client had a pretty amazing idea – a Timbit Smash! if you’re Canadian, you can’t help but love this. When you think about it, Timbits are the PERFECT size for kids. They’re small, they can hold one (or two or three) in each hand! As soon as her mama suggested it, I absolutely loved the idea. One year sessions can always be fun, include meaningful props or ideas, and they don’t need to always be a cake smash! Timbits, donuts, macaroons, and our paint sessions are just a couple of other ideas. If anyone else has an idea, let’s chat! I want to help capture your unique ideas. Cake is always a fun idea too! Their maternity session came at a time when the snow is still melting, Edmonton was still brown and ugly, and nothing is green yet. We picked the U of A to photograph their session to use the beautiful buildings. As always, the family was all included in their session, and Brittany’s sister even came to be in a few of the photos! Sisters both expecting at the same time.- they’re going to have loud and bustling family dinners! I had a blast with these guys. It was a bit of a chilly shoot, but so much fun! Bag packed with all the essentials waiting at the door. We were ready to get to the hospital. 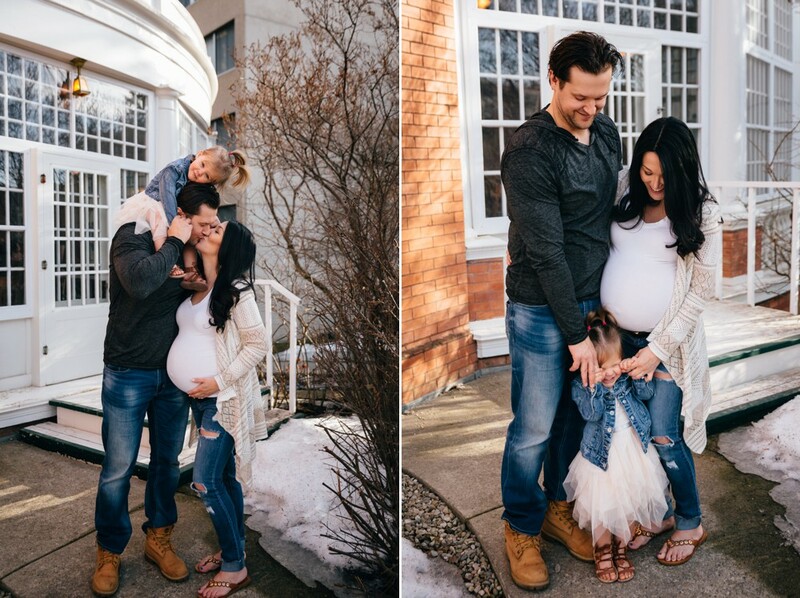 Everything had been planned for this lovely family’s Fresh 48 session in Edmonton. As with many babies they are on their own schedules and plans can quickly change. When the time came to leave we found out they had already been sent home. To have such easy access to a hospital is wonderful but there is nothing like being at home and settling in with your new family. Our shoot was now a comfortable, at home Fresh 48 Session. All together as a family of four. Having photographed babies in many different situations we understand that flexibility with our schedule is key. Also every location is unique and offers something different to the pictures that we capture. 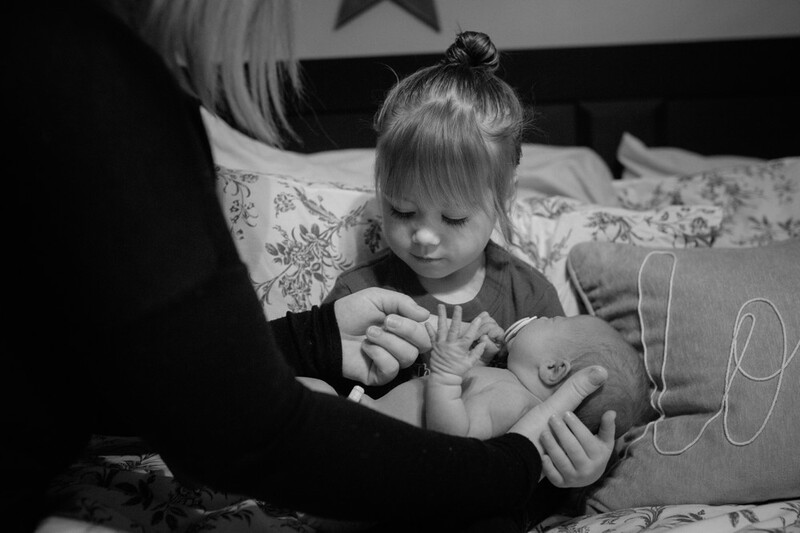 In this instance we were able to capture the first days at home as the family adjusted to being four. We met Katelynn and family for the first time for this incredible winter maternity session (remember that RED DRESS?! check it out here). It was wonderful to be able to continue the journey with them now Everly had arrived. Coming to the hospital offers the opportunity for us to capture your family as you settle into your room. It is the time when you discover all the details of your new baby. Family and friends are welcome to visit whilst we are there so that we can photograph all of the raw emotion that comes with a beautiful new baby. If given enough notice we would love to be there to photograph the nurses finishing measurements and your baby being welcomed by grandparents and siblings. An at home Fresh 48 Session offers the chance for us to capture your family settling in at home. Feeling the comfort of your own space can be much more relaxing compared to the bustle of a busy hospital ward. These sessions are unposed, it’s all about capturing a family together in these first, fresh days. Contact us here for more information and to book your Fresh 48! 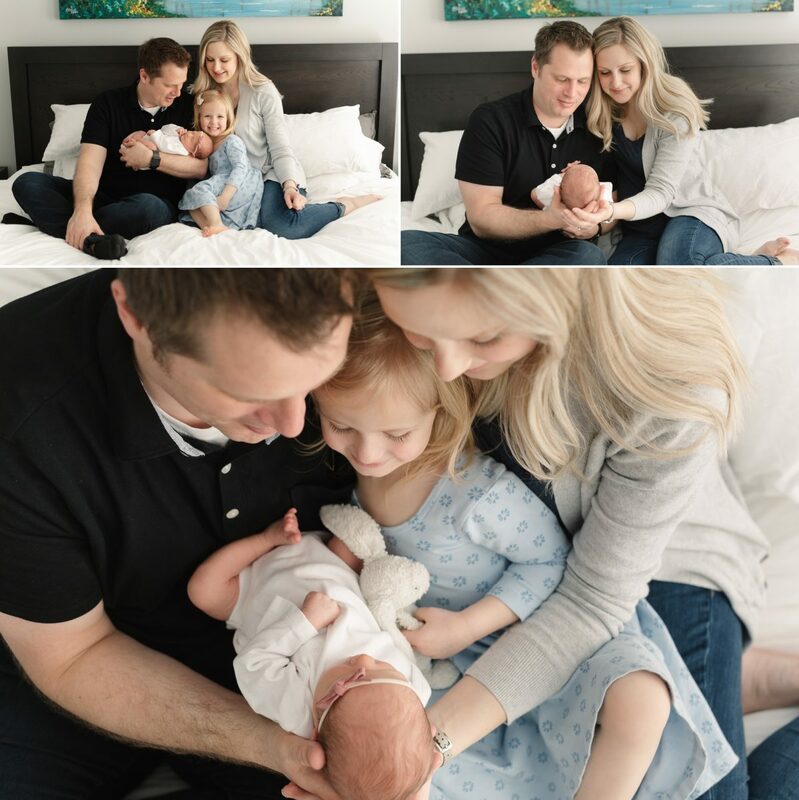 A light and bright home newborn session is one of my favourites to photograph! So on a recent day in March, during Edmonton’s everlasting winter, the Kuryk family home was the perfect place to be. Warm sunshine filtering in through large windows masked the chill that still existed outside. With the thermostat adjusted a little to keep baby Sophie toasty warm I photographed this lovely family. Being in someone’s home surrounded by the memorabilia of their life truly freezes a moment in time. How often do you change the pictures on your wall, move your furniture to a new spot? All of these changes are part of your life novel. 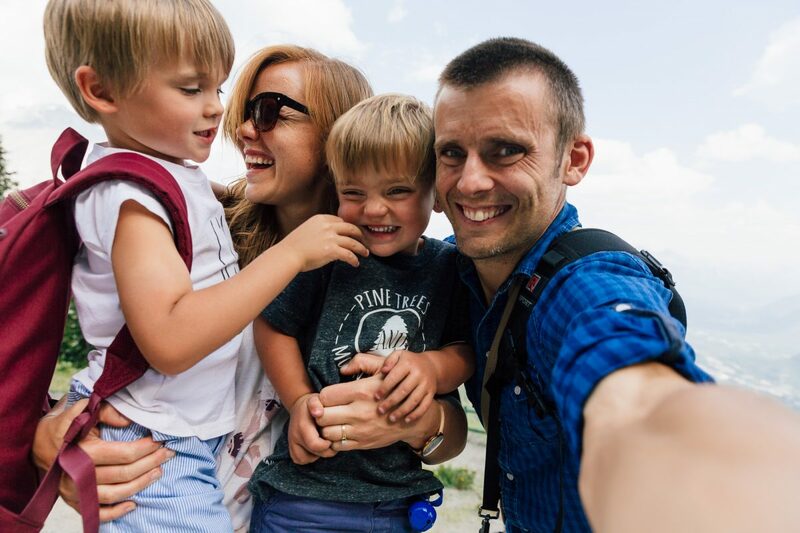 Capturing your family in your surroundings is the perfect way to make a memory. The perfect way to start a story that you can tell your children when they are older; this is what our home looked like when you were born! 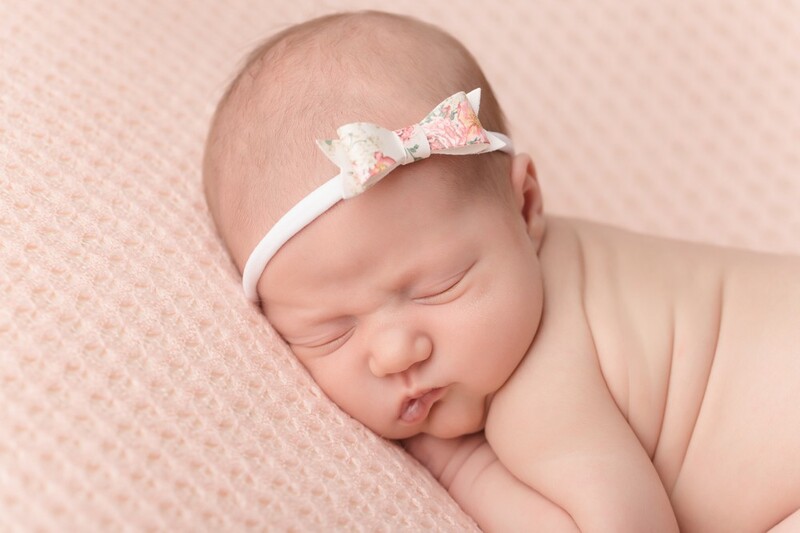 In home newborn sessions are also a great option if you have older children. When I first arrived at the Kuryk’s home, Ashleigh, their older daughter, was very unsure about me being there and having pictures taken. This is a very common reaction and something Shauna and I work with on a regular basis. We take our time. I often take a few shots of just the baby or baby with mum and dad first and ask siblings to come and help. It wasn’t long before Ashleigh was comfortable on the bed with her little sister Sophie laying on her legs. Contact us here for more information and to book your Newborn Session!